Just a few months ago, the Los Angeles Philharmonic made a fairly big splash in the brass world by offering the soon-to-be-vacant (in 2012) Principal Trumpet chair to Thomas Hooten, currently principal of the Atlanta Symphony. Now it seems they’re doing it again, this time to fill the position of Principal Trombone. Multiple sources have indicated that Nitzan Haroz, currently principal of the Philadelphia Orchestra, beat out a different principal trombone from another major US orchestra in a recent audition. It looks he will be taking a one year leave of absence from his current orchestra so that he and the LA Phil can decide if they want to make a long-term commitment to each other. Nitzan Haroz, future LA Phil Principal Trombone? It would fill a position that has been open since the sad and untimely death of Steven Witser in 2009, after at least two previous attempts to find a candidate through open auditions failed. Mr. Witser was very well-regarded within the LA Phil despite having just joined the orchestra two years prior from the Cleveland Orchestra. His hiring was itself the final result of a nearly year-long process to replace the legendary Ralph Sauer, trombone demi-god and principal with the LA Phil since 1974, who had just retired in 2006. 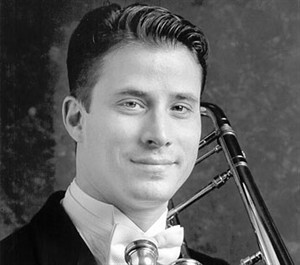 There’d be a touch of irony: in 2007, before Mr. Witser accepted the job to come to Los Angeles, the Principal Trombone chair was first offered to Matt Vaughn, Mr. Haroz’s Associate Principal in Philly. He decided to turn down the position, paving the way for Mr. Witser to move to SoCal. If/when Messers. Hooten and Haroz accept their offers and eventually earn tenure, they would help solidify a brass section that has been in a bit of flux over the past few years. Combined with the recent hire of Andrew Bain as Principal Horn (and assuming he earns tenture as well), this may lead to some much-needed stability for these positions for years — even decades — to come. Speaking of horns . . . someone had inquired if I knew who the guest/substitute horn players are this year: for the concerts I’ve attended, Paul Klintworth has been playing 4th horn and Mark Adams has played assistant horn (though this past weekend he sat in as 2nd horn). Beyond that, I can’t tell you. Back over in the strings . . . Tao Ni, a Colburn School alum and current cellist with the Cincinnati Symphony, won the audition for Associate Principal Cello, a position that opened up when Daniel Rothmuller moved back into the section and was given the title of Associate Principal Emeritus. Mr. Ni sat first chair with the orchestra for the Adams/Chapela/Prokofiev concerts earlier in the season. As it happens, Susan Babini, one of the other finalists for the position who played a trial with the orchestra on a different week, was recently named Principal Cello of the Milwaukee Symphony. Tags: Nitzan Haroz, Philadelphia Orchestra, Susan Babini, Tao Ni, Thomas Hooten. Bookmark the permalink.